After making the move from Boston to Los Angeles to pursue his career in music and sound design, Asteroids and Earthquakes has been quickly finding a place for himself in the welcoming warmth of California. Dreamland Security, his debut album off of Mycelium Music, will take the listener on a journey of sonic experiences to assist in the escape of reality by mimicking the epic randomness of a deep dream. 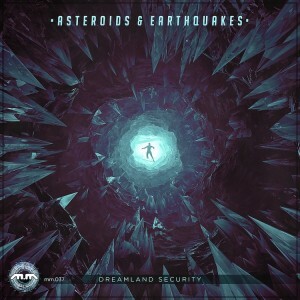 The wide variety of emotions are presented through Asteroids and Earthquake’s passion for sound design, which led him to make much of this album from field recordings he manipulated into an almost unrecognizable pallete of sounds. Mastered by David Westbom with artwork by Nicholas Yochum. MP3 Download | FLAC Download | WAV Download · Download count: 5,651. WOW Simply amazing sound design approach. Those textures sound really nasty. Top quality release! Nice … I’m gonna have to get the headphones out. Really great stuff. Awesome production. Love the energy. Wonderful Sounds to fell in trance…and love it.